How to analyze metagenomics data? 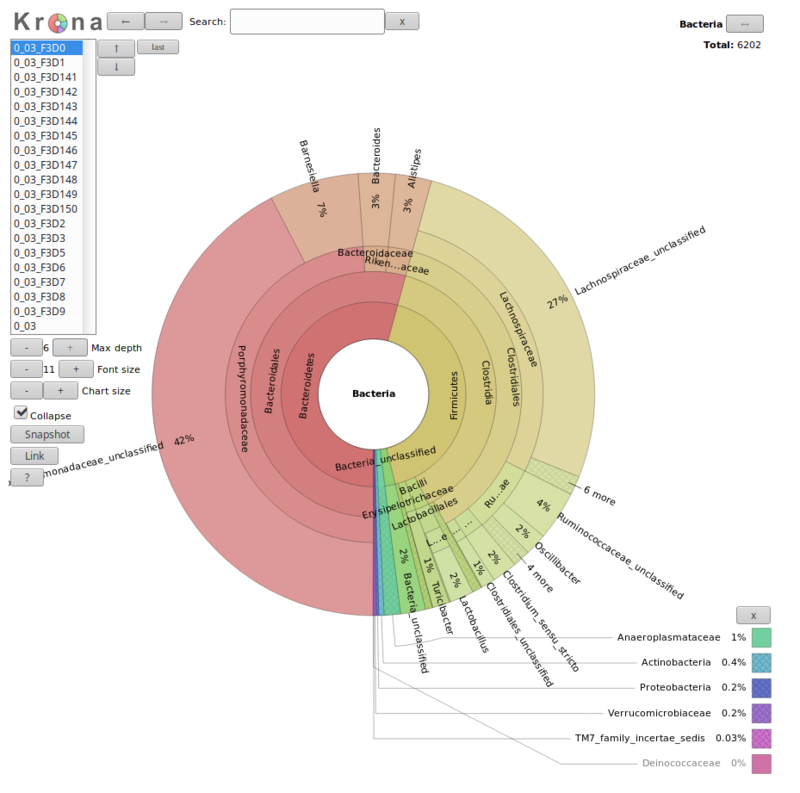 What information can be extracted of metagenomics data? What is the difference between amplicon and shotgun data? What are the difference in the analyses of amplicon and shotgun data? In this tutorial, we will introduce the two mian types of analyses with their general principles and differences. For a more in-depth look at these analyses, we recommend our detailed tutorials on each analysis. We will use two datasets (one amplicon and one shotgun) from the same project on the Argentinean agricultural pampean soils. In this project, three different geographic regions that are under different types of land uses and two soil types (bulk and rhizospheric) were analyzed using shotgun and amplicon sequencing. We will focus on data from the Argentina Anguil and Pampas Bulk Soil (the original study included one more geographical regions, see). Amplicon sequencing is a highly targeted approach for analyzing genetic variation in specific genomic regions. In the metagenomics fields, amplicon sequencing refers to capture and sequence of rRNA data in a sample. It can be 16S for bacteria or archea or 18S for eukaryotes. The highly conserved regions make it easy to target the gene across different organisms, while the highly variable regions allow us to distinguish between different species. With amplicon data, we can determine the micro-organisms from which the sequences in our sample are coming from. This is called taxonomic assignation. We try to assign sequences to taxons and then classify or extract the taxonomy in our sample. In this analysis, we will use the mothur tool suite, but only a small portion of its tools and possibilities. To learn more in detail about how to use this tool, check out the full mothur tutorial. We will perform a multisample analysis with mothur. 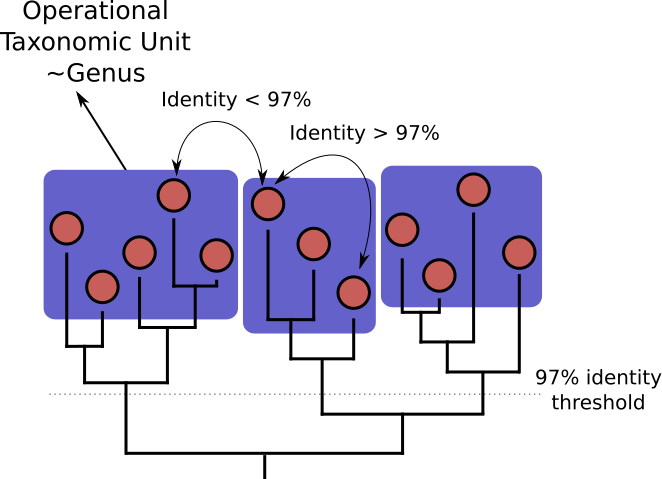 To do this, we will merge all reads into a single file, and create a group file, indicating which reads belong to which samples. Have a look at the group file. It is a very simple file, it contains two columns: the first contains the read names, the second contains the group (sample) name, in our case pampa or anguil. How many sequences were unique? How many duplicates were removed? 19,502 unique sequences and 498 duplicates. This can be determined from the number of lines in the fasta (or names) output, compared to the number of lines in the fasta file before this step. 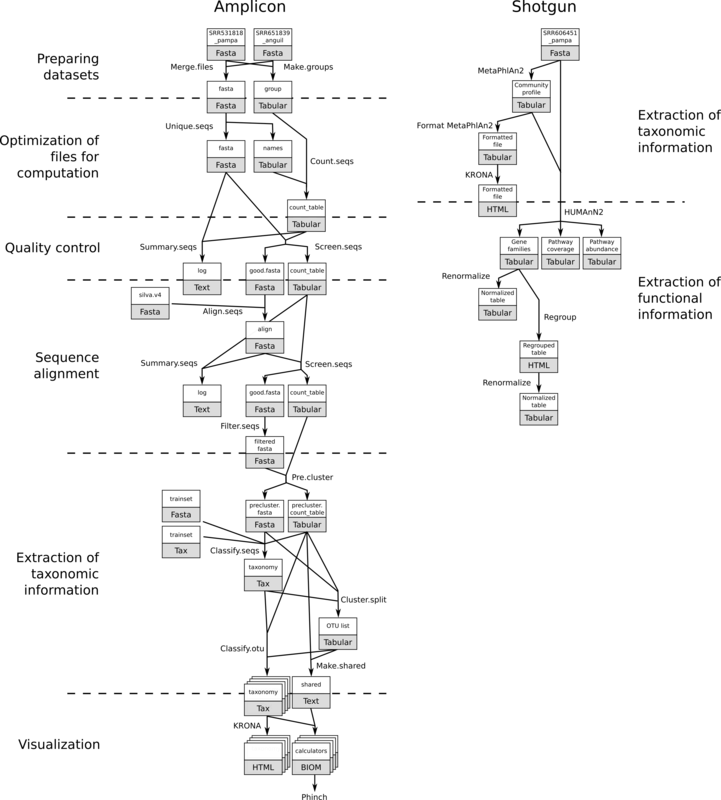 This Unique.seqs tool outputs two files: a fasta file containing only the unique sequences, and a names file. The names file consists of two columns, the first contains the sequence names for each of the unique sequences, and the second column contains all other sequence names that are identical to the representative sequence in the first column. The Count.seqs file keeps track of the number of sequences represented by each unique representative across multiple samples. We will pass this file to many of the following tools to be used or updated as needed. The first step in any analysis should be to check and improve the quality of our data. For more information on the topic of quality control, please see our training materials here. This tells us that we have a total of 19,502 unique sequences, representing 20,000 total sequences that vary in length between 80 and 275 bases. Also, note that at least some of our sequences had some ambiguous base calls. Furthermore, at least one read had a homopolymer stretch of 31 bases, this is likely an error so we would like to filter such reads out as well. If you are thinking that 20,000 is an oddly round number, you are correct; we downsampled the original datasets to 10,000 reads per sample for this tutorial to reduce the amount of time the analysis steps will take. The following tool will remove any sequences with ambiguous bases (maxambig parameter), homopolymer stretches of 9 or more bases (maxhomop parameter) and any reads longer than 275 bp or shorter than 225 bp. Aligning our sequences to a reference helps improve OTU assignment [Schloss et. al. ], so we will now align our sequences to an alignment of the V4 variable region of the 16S rRNA. 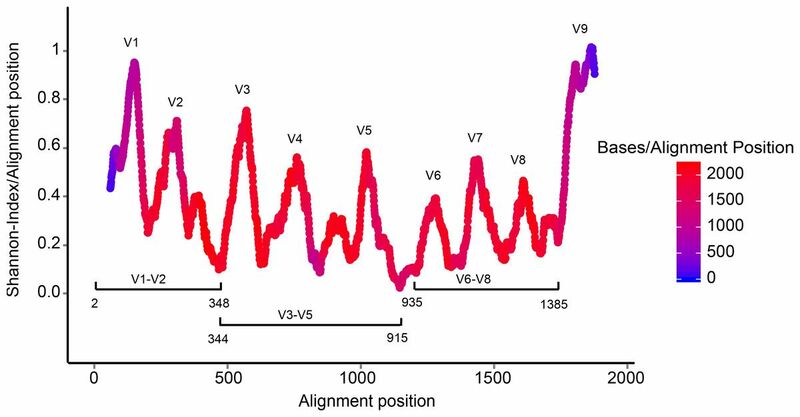 This alignment has been created as described in [mothur’s MiSeq SOP] from the Silva reference database. This step may take a few minutes, please be patient. How many sequences have been aligned? Between which positions most of the reads are aligned to this references? From this we can see that most of our reads align nicely to positions 3080-13424 on this reference. This corresponds exactly to the V4 target region of the 16S gene. To make sure that everything overlaps the same region we’ll re-run Screen.seqs to get sequences that start at or before position 3,080 and end at or after position 13,424. How many sequences were removed in this step? 4,579 sequences were removed. This is the number of lines in the bad.accnos output. The main questions when analyzing amplicon data are: Which micro-organisms are present in an environmental samples? And in what proportion? What is the structure of the community of the micro-organisms? In 16S metagenomics approaches, OTUs are clusters of similar sequence variants of the 16S rDNA marker gene sequence. 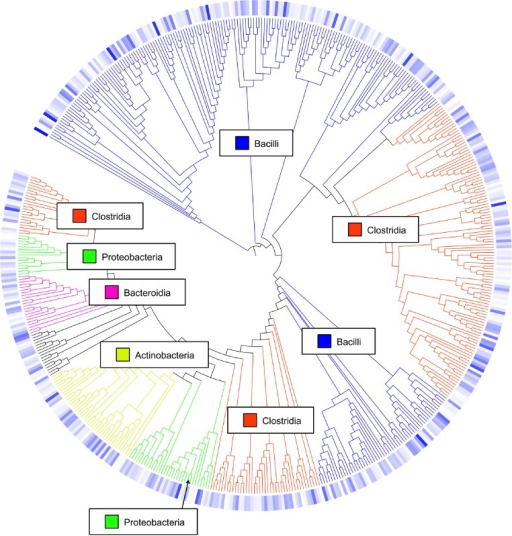 Each of these clusters is intended to represent a taxonomic unit of a bacterial species or genus depending on the sequence similarity threshold. Typically, OTU clusters are defined by a 97% identity threshold of the 16S gene sequence variants at genus level. 98% or 99% identity is suggested for species separation. How many unique sequences are we left with after this clustering of highly similar sequences? We would like to classify the sequences using a training set, which is again is provided on [mothur’s MiSeq SOP]. This step may take a couple of minutes, now may be a good time to grab a cup of tea/coffee. Have a look at the taxonomy output. You will see that every read now has a classification. We obtain a table with the columns being the different identified OTUs, the rows the different distances and the cells the ids of the sequences identified for these OTUs for the different distances. How many OTUs with taxonomic assignation are found for the Anguil sample? And for the Pampa sample? What is the annotation of first OTU and its size? The result is an HTML file with an interactive visualization, for instance try clicking on one of the rings in the image or playing around with some of the settings. This produced a single plot for both your samples, but what if you want to compare the two samples? In this new Krona output you can switch between the combined plot and the per-sample plots via the selector in the top-left corner. Which soil sample had a higher percentage of Acidobacteria, anguil or pampa? what were the respective percentages? The anguil sample had a higher proportion of Acidobacteria. The exact percentages can be found by looking at the pie charts at the top right-hand corner after clicking on the label Acidobacteria. For anguil the percentage is 36%, for the pampa sample it is 26%. 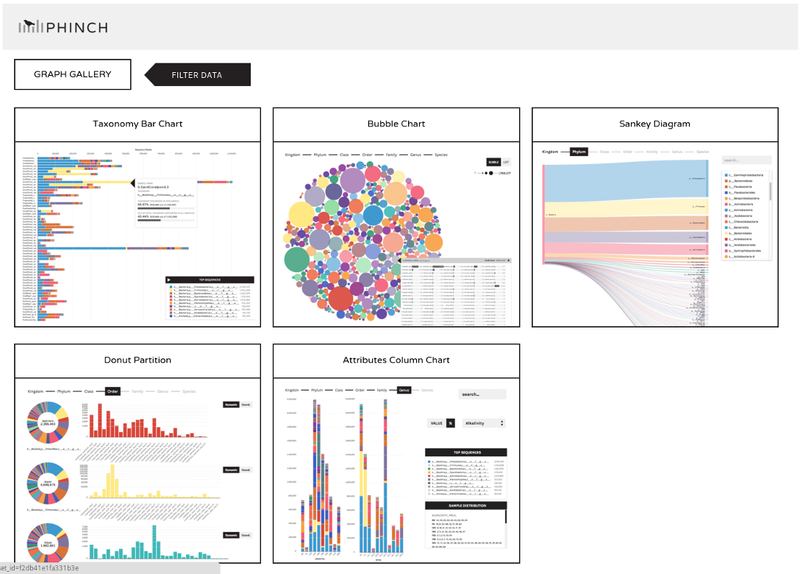 To further explore the community structure, we can visualize it with dedicated tools such as Phinch. If this link is not present on your Galaxy, you can download the generated BIOM file and upload directly to Phinch server at http://phinch.org. Once we have information about the community structure (OTUs with taxonomic structure), we can do more analysis on it: estimation of the diversity of micro-organism, comparison of diversity between samples, analysis of populations, … We will not go into detail of such analyses here but you can follow our tutorials on amplicon data analyses to learn more about them. In the previous section, we saw how to analyze amplicon data to extract the community structure. Such information can also be extracted from shotgun metagenomic data. In shotgun data, full genomes of the micro-organisms in the environment are sequenced (not only the 16S or 18S). 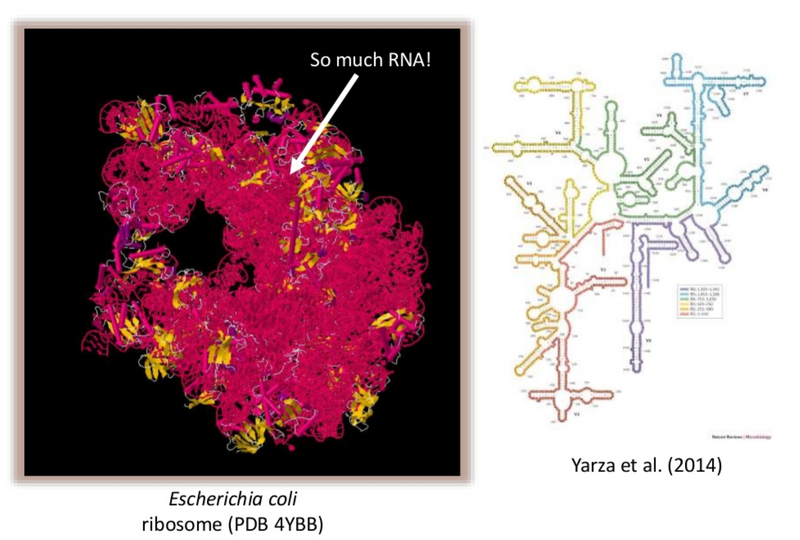 We can then have access to the rRNA (only a small part of the genomes), but also to the other genes of the micro-organisms. Using this information, we can try to answer questions such as “What are the micro-organisms doing?” in addition to the question “What micro-organisms are present?”. In this second part, we will use a metagenomic sample of the Pampas Soil (SRR606451). In this tutorial, we use the second approach with MetaPhlAn2. This tools is using a database of ~1M unique clade-specific marker genes (not only the rRNA genes) identified from ~17,000 reference (bacterial, archeal, viral and eukaryotic) genomes. Each line contains a taxa and its relative abundance found for our sample. The file starts with high level taxa (kingdom: k__) and go to more precise taxa. What is the most precise level we have access to with MetaPhlAn2? What are the two orders found in our sample? What is the most abundant family in our sample? We would now like to answer the question “What are the micro-organisms doing?” or “Which functions are performed by the micro-organisms in the environment?”. In the shotgun data, we have access to the gene sequences from the full genome. We use that to identify the genes, associate them with a function, build pathways, etc., to investigate the functional part of the community. This step is long so we generated the output for you! Gene family abundance is reported in RPK (reads per kilobase) units to normalize for gene length. It reflects the relative gene (or transcript) copy number in the community. The “UNMAPPED” value is the total number of reads which remain unmapped after both alignment steps (nucleotide and translated search). Since other gene features in the table are quantified in RPK units, “UNMAPPED” can be interpreted as a single unknown gene of length 1 kilobase recruiting all reads that failed to map to known sequences. Pathway coverage provides an alternative description of the presence (1) and absence (0) of pathways in a community, independent of their quantitative abundance. How many gene families and pathways have been identified? What percentage of sequences has not be assigned to a gene family? What is the most abundant gene family? With the previous analyses, we investigate “Which micro-organims are present in my sample?” and “What function are performed by the micro-organisms in my sample?”. We can go further in these analyses (for example, with a combination of functional and taxonomic results). We did not detail that in this tutorial but you can find more analyses in our tutorials on shotgun metagenomic data analyses. Both analyses are quite complex! However, in this tutorial, we only showed simple cases of metagenomics data analysis with subset of real data. Check our other tutorials to learn more in detail of how to analyze metagenomics data. This material is the result of a collaborative work. Thanks to the Galaxy Training Network and all the contributors ( Saskia Hiltemann, Bérénice Batut)!